With the success of You’re Telling Me, Paramount allowed W.C. Fields to submit the story for his next feature, The Old Fashioned Way. In doing so, the Great Man created one of his most endearing characters, Mark Antony McGonigle, the dishonest head of a traveling theatrical company. The Great McGonigle, as he is more often called, leaves a trail of bad notices and unpaid bills in his wake, as he moves his troupe from town to town performing the classic melodrama, The Drunkard (what else?). The Great Man often portrayed charlatans and hucksters in his films, based on the crooked men that cheated him during his early days on the stage. The Old Fashioned Way is far and away the best of these movies. In addition to containing McGonigle, Fields’ most loveable rogue, the picture also features W.C.’s classic battle with child-actor, Baby LeRoy. McGonigle absorbs numerous indignities at the hand of the toddler--including having his pocket watch soaked in molasses--while other adults are observing, but as soon as he has the brat alone, he gives the kid a solid kick in the pants. No other comic of the time (and few since) could get away with booting a small child and make the audience love him all the more for it, but Fields pulled it off with ease. Like an olive that provides the finishing touch to a martini, The Old Fashioned Way contains a topper that is one of the most magical moments in Fields’ filmography. At the conclusion of the troupe’s performance of The Drunkard, McGonigle juggles for the audience. It is the only filmed record of the Great Man performing a portion of the legendary juggling act that first brought him to fame. On celluloid, W.C. rarely displayed more than a hint of the dexterity of his nimble fingers--a flip of a cane here, the twirl of a hat there--because he feared that he had lost much of his skill over time through his love of fermented fluids. Luckily, he made an exception in this case. 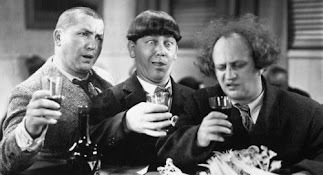 In truth, The Old Fashioned Way contains no explicit boozing, but the “evils” of drink are enacted by the theatrical troupe in the temperance play within the film. More importantly, this movie is simply too good to leave off this list. As an interesting side note, the Great Man briefly dated Judith Allen, the actress that plays his daughter in the picture. Potent Quotables--(From the play within the film) MARY: I must remain and find my husband. MCGONIGLE (as Squire Cribbs): He would laugh in his drunken ribaldry could he hear you speak thus. 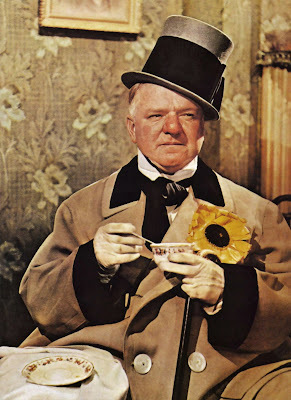 Video Availability--DVD, as part of the W.C. Fields Comedy Collection, Vol. 2 (Universal). You can also view a low-rez clip of the juggling scene here. Similarly Sauced Cinema--Fields also lampooned temperance melodramas in the funniest short subject ever made, The Fatal Glass of Beer (1933). The Drunkard also served as the basis for a less successful comedy, The Villain Still Pursued Her (1940), featuring Buster Keaton and a bunch of lesser-knowns.